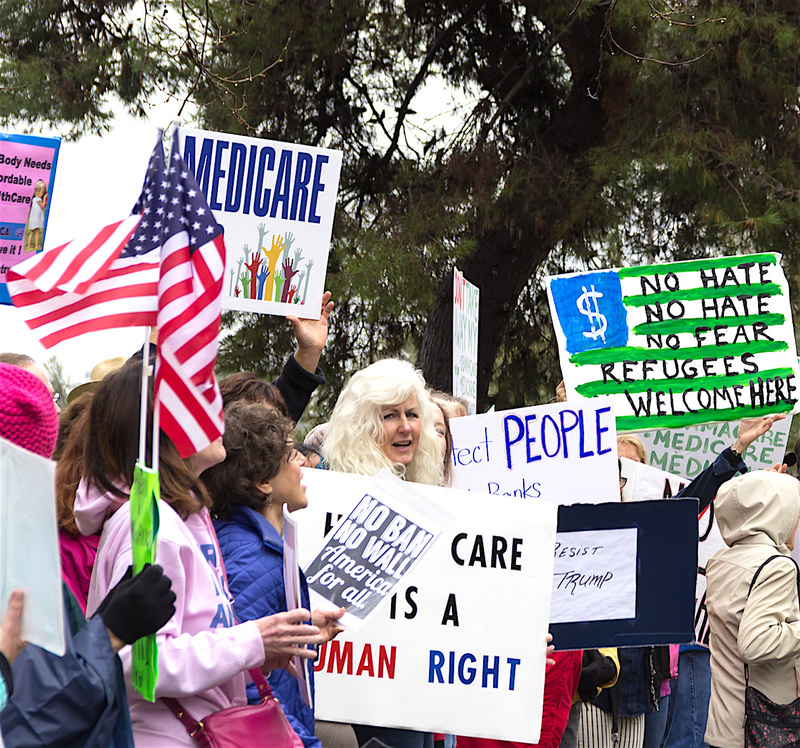 Nearly 400 people braved some nasty weather Tuesday to rally at five separate San Diego County and area events, asking for political accountability and preservation of the Affordable Care Act known popularly as Obamacare. They also asked for in-person town hall meetings and pledges to oppose President Trump’s proposed Muslim ban. Close to 140 people were caught in the rain outside of Rep. Darrell Issa’s Vista office with a delegation eventually meeting with Issa’s 49th Congressional District director Bill Christiansen, according to Tahra Ludwig, a North County Indivisible spokeswoman. Concerned constituents expressed concerns around the repeal of the ACA without a replacement, she said. Concerns were the same as the last time a delegation tried to meet with Christiansen, namely last week. This time, voters also asked about Issa’s support of Trump’s proposed Muslim ban, now on hold following a Washington federal judge ruling. Another continuing bone of contention is Issa’s apparent refusal to hold an in-person town hall meeting. Protestors pointedly requested such a meeting at 6 p.m. Tuesday, Feb. 21. A previously scheduled town hall meeting sponsored by Health Access and other local groups was expected to take place at that time at Vista’s Jim Porter Recreation Center. Indivisible members at Tuesday’s Christiansen’s session said Issa — the wealthiest member of Congress — said such an in-person meeting would cost too much money. Meanwhile, heat was turned up in the case of Rep. Duncan Hunter, (R-50th District) whose use of campaign funds for personal expenses has sparked several ethics investigations including one by the Congressional Office of Ethics he voted to abolish at a closed door Republican caucus meeting before word of the measure became public and an outraged public reaction canceled the abolishing attempt. 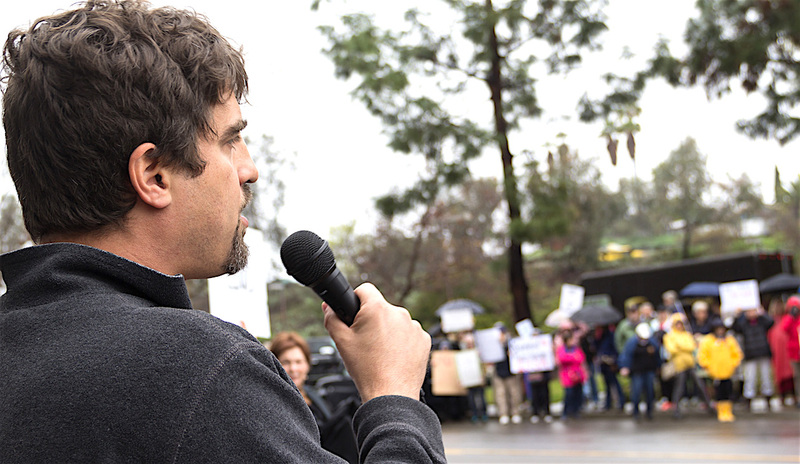 The protest outside Hunter’s El Cajon office drew about 50 to 60 constituents, undaunted by rainy weather, according to East County Magazine’s Miriam Rafferty. Several met with Hunter’s staff inside while others rallied on the street outside, Rafferty said. The event was organized by Indivisible through it website: https://www.indivisibleguide.com/. Hunter was Trump’s second House endorser, and has continued to stand by the president. The group cited opposition to Trump’s executive orders banning refugees and his call to deport an estimated 11 million undocumented immigrants, as well as Trump’s appointment of Sen.Jeff Sessions as Attorney General and Betsy DeVos as Education Secretary. Indivisible organizers said Hunter’s deputy district director Michael Harrison met with six group members from the group to discuss Hunter’s support of repealing the ACA without a replacement, and his unwillingness to support federal funding for some women’s health care needs, specifically birth control. They also discussed the Muslim Ban, praised Hunter’s stand on making exceptions to the ban for those who aided our military, such as interpreters, and requested he co-sponsor two bills: HR 724 to rescind and defund Trump’s Muslim Ban and HR 804 to prevent political appointments from serving on the National Security Council. However, Hunter’s office didn’t commit to holding an in-person town hall. The largest of Tuesday’s demonstrations met downtown in front of Sens. Dianne Feinstein’s and Kamala Harris’ offices to show support for their willingness to take a stand against cabinet nominees being voted on this week, and to reinforce our passionate opposition to the Trump Agenda. At noon, the group of 160, delivered a group letter to Feinstein’s district director, Bill Kratz, who met with constituents, heard personal stories, and engaged in a discussion of the merits of the ACA. An hour later, a smaller group, marched peacefully to Harris’ office, where a staffer came down to hear concerns about Republican plans to repeal the ACA and institute a Muslim Ban. Meanwhile, at Temecula, in Riverside County, nearly 50 local residents arrived at Hunter’s office at 10:30 a.m. Tuesday, Ludwig said. However, despite posted office hours of 10 a.m. to 3:30 p.m. — surprise — nobody was home. The group left notes on the door, to let staffers know they were attempting to meet with them. Hunter’s representative reportedly declined to say when an in-person town hall could be scheduled. Malloy to Hunter in 50th Dist: It’s on! Be the first to comment on "Constituents flood Issa, Hunter offices"